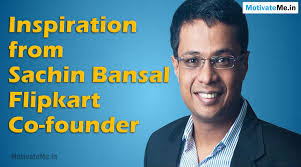 Sachin Bansal is an Indian Internet entrepreneur and Software Engineer from Indian Institute of Technology ( IIT Delhi, India ) who co-founded the country's largest e-commerce business Flipkart along with Binny Bansal. He is also awarded the tag "Entrepreneur of the year-ET Awards" for the year 2012-13. Note - Flipkart has started the grand Gadget Day from 24-26th July. It's the time to grab the amazing offers on next-generation Laptops, Cameras and Accessories, Tablets, Audio, Personal Health Care, IT Peripherals and Gaming! Flipkart also launched the SmartBuy Day on 24 July - You can Get 15% Cashback with PhonePe on Flipkart SmartBuy products! So don;t be late. 5. Flipkart SmartBuy Day [24 July]! Sachin was born on 5 August 1981 in Chandigarh ( Capital city of Punjab and Haryana, India ). He did his schooling from St. Anne's Convent School, Chandigarh and then gained engineering degree in computer science engineering from IIT ( Indian Institute of Technology, Delhi). His partner and co founder of Flipkart, Binny Bansal is also sharing the same sir name with him and co incidentally schooled from St. Anne's Convent School, Chandigarh like him is no way in relation to each other by blood or some other way. They are only doing business with each other. After the completion of his degree in the year 2005, Sachin joined a company called "Techspan" where he worked for a few months and later joined Amazon.com India as Senior Software Engineer somewhere in 2006. After working there for few more months, he came to realise that why not to start a company related to e-commerce in India as the services were quite low here at that time. They were planning to come up with a search engine initially but dropped the idea later. It was the year 2007 when Sachin along with Binny founded Flipkart and grabbed the marker soon with this innovative idea. He is currently living in Bangalore along with his wife and children. His company has an estimated Net worth of $ 500 million. Within few years of Flipkart's existence, it raised funds through venture capital funding and with some more growth more funds were arrived in. It repaid the investors with its terrific performances year by year. In the year 2008-09, it made sales to tune up to 40 million INR followed by 200 million in next year. It made the target of hitting one billion marks this year ( 2015 ). Initially, the company faced two basic problems. First one was Online Payment gateway and other was Supply Chain system. Problems were not easy to tackle. Then they introduced the system of Cash on delivery to tackle the first one and by launching their own supply chain management system to deliver orders in a timely fashion to tackle the second one. They won the trust of their customers soon and became the most successful e-business company. It also acquired few companies like Myntra.com, LetsBuy.com etc., to better their presence in the market. Thus it is worth to be praised with success if one came up with a new idea and is not so hard to write the success story by own.